This year’s Topps Baseball product theme has been "Gold" with The Golden Giveaway, Golden Moments inserts, Gold parallels, real Gold cards and more. When Series 1 was released, collectors rushed to get their wrappers back to Topps and all of the Gold Rush cards were gobbled up quickly. With just 5 days left until the launch of 2012 Topps Series 2, collectors will have another shot at getting their hands on these popular wrapper redemption sets. This Series 2 set continues with 50 new subjects and selected autographs from such stars Bryce Harper, Yu Darvish, Ken Griffey Jr. and more, but that is not all that is new. This program comes with a major difference, which benefits all collectors. Topps has announced it is offering a Gold Rush Wrapper Redemption program not only for redeemed hobby wrappers, but for retail wrappers too. 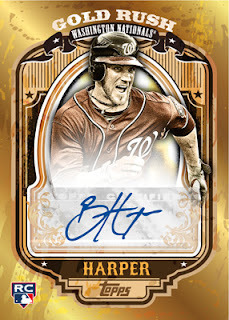 Just like with Series 1, Collectors sending in 50 Hobby wrappers (or 14 HTA Jumbo wrappers) of 2012 Topps Baseball will receive a 5-card cello pack of exclusive Gold Rush cards. 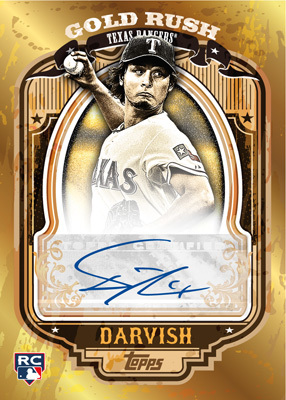 In addition, collectors who send in 50 retail wrappers (12-card packs only) will also receive a 5-card Gold Rush pack. And, no, you can’t combine Hobby and Retail wrappers to make the 50 required. Hooby and Retail wrappers should be kept separated. But supplies are limited. There are an incremental 10,000 5-card packs available for Retail in addition to the 10,000 Hobby packs. 1 - All packages must be postmarked no earlier than June 6th, 2012. 2 - Hobby and Retail wrappers must be packaged and sent to Topps separately and clearly marked “HOBBY” or “RETAIL” on outside of package. Combined Retail and Hobby packages will not be accepted. 3 - Topps will accept 2012 Topps Baseball Series 2 wrappers only. This is limited to HOBBY, HTA and 12-card RETAIL wrappers. 4 - Each household will be limited to receive a total of TEN 5-card packs. 5 - This program is valid while supplies last. Make sure you are following Topps on Facebook and Twitter @toppscards for real time updates about the remaining availability of Gold Rush wrapper redemption packs .